It is not uncommon for people to react with awe to their first up-close encounter with a balloon from the Macy’s Thanksgiving Day Parade. But when Takashi Murakami saw his contributions to Thursday’s event, he bowed. Twice. 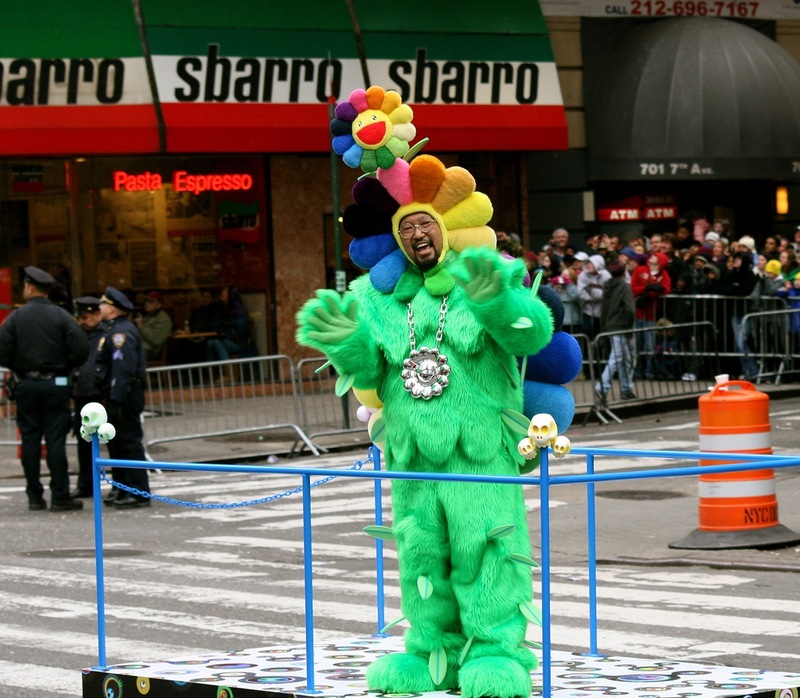 On Wednesday afternoon, on a stretch of West 81st Street in Manhattan where brightly colored, 30-foot-tall inflatable versions of his characters Kaikai and Kiki were wriggling and writhing underneath a huge net, Mr. Murakami, the Japanese pop artist, held a brief Shinto ceremony for purity and luck. He stood at a table where he poured out a glass of water and a glass of sake in front of two plates, one of white rice and one of sea salt. He gave two bows and clapped twice, then declared the ritual complete. Kaikai, a childlike character in a rabbit costume, and Kiki, an impish figure with three eyes and two dangling fangs, were ready to greet the parade-watching public. In an interview after the ceremony Mr. Murakami, his bushy hair tied in a knot, seemed exuberant. He said he was less concerned about whether Kaikai and Kiki — who do not promote any television cartoon shows or breakfast cereals, and are merely ambassadors of Mr. Murakami’s own playfully esoteric art — could hold their own in the Macy’s parade than about Thursday morning’s weather. 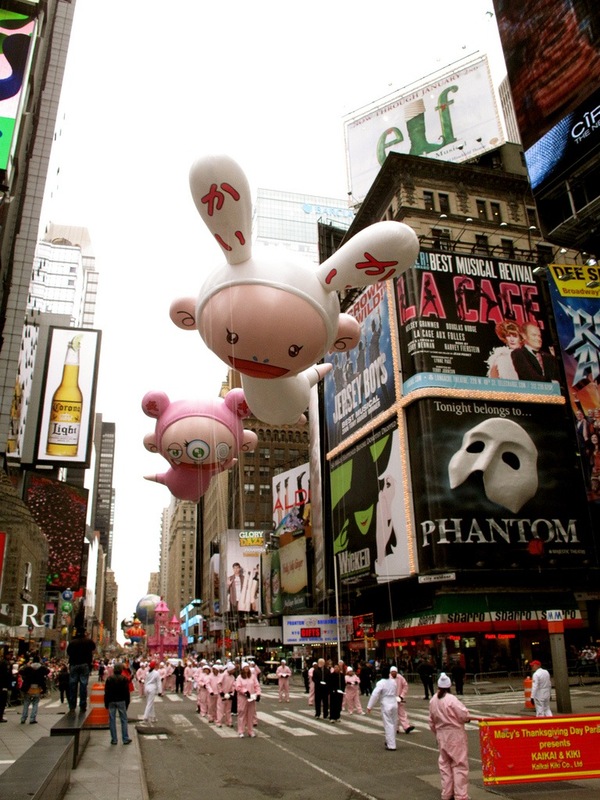 In that spirit the sculptor Tom Otterness created a Humpty Dumpty balloon for Macy’s in 2005, depicting that nursery-rhyme character suspended upside-down in a perpetual tumble. In 2007 the parade added a shimmering silver rabbit designed by Jeff Koons, and the following year incorporated a giant Keith Haring figure holding up a heart, to mark what would have been the artist’s 50th birthday. 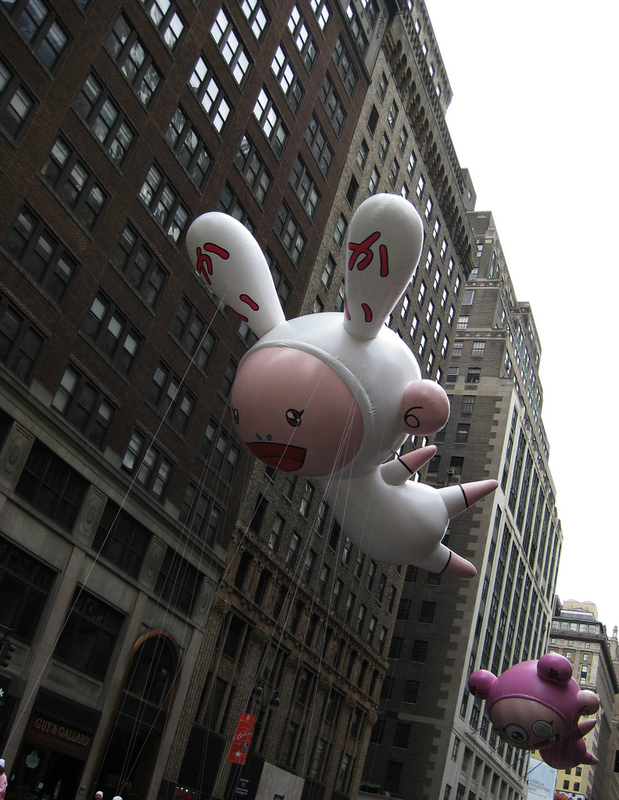 In 2008 Macy’s also began communicating with Mr. Murakami, who in the global art scene is known as much for his inflatable sculptures of psychedelic anime-style cartoon characters as for the Louis Vuitton handbags and Casio watches he designs. But at that time he was preparing for a retrospective at the Brooklyn Museum and could not immediately contribute to the parade. The completed balloons were flown for the first time this month at a Macy’s testing facility in South Dakota, but Mr. Murakami — who plans to accompany them in the parade wearing a flower costume of his own design — had not seen the finished works until Wednesday. Nor, for that matter, have the thousands of children who will watch the parade live — or the millions who will watch on television — Thursday morning, and have likely never heard of Mr. Murakami. Watching the inflation of Kaikai and Kiki on 81st Street, Tami Marsden and her son Alex, 6, were less sure about what they were seeing.